Valerie Snobeck, MFA’08, has created a piece titled American Standard Movement as part of the annual Threshold series sponsored by the Smart Museum of Art. 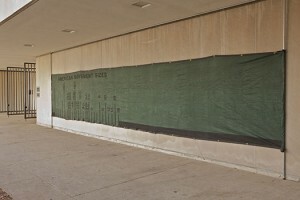 The site-specific work, presented in the Vera and A.D. Elden Sculpture Garden, re-uses debris netting that was previously part of a construction project on the University of Chicago campus in order to open up questions about environment, the passage of time, and progress. Such netting serves a function—to catch debris let loose by construction activities—and also behaves as an aesthetic marker of the construction site itself. Snobeck’s work takes this duality as a point of entry. Netting marks the absence of a wall, but is, unlike a wall, woven and hung, permeable. In American Standard Movement, the netting is co-opted, but not necessarily displaced. The painting on the netting references tools used in watch repair in order to measure internal components, which, given the banner’s outdoor setting, draws the viewer’s attention to the body and the environment as component parts situated in larger systems. American Standard Movement will show until October 2013. For more information on current exhibitions at the Smart Museum, please click here. Posted in Uncategorized. Tagged with Alumni, Smart Museum of Art, Visual Arts.